As the success story of turnkey connections provider and high voltage power specialist Smith Brothers continues to unfold, Business Development Manager Danielle Tile explains why the UK contractor is extending its service provisions across the Irish Sea. An island full of new challenges and exciting opportunities is familiar territory for Smith Brothers. Since its beginnings in 1990, the power specialist has completed hundreds of electrical engineering and power assignments throughout the UK and beyond. Progressing from a small, family-run business based in West Yorkshire to a professional international contracting firm, the 60-strong team is continually trusted by some of the biggest household names, to complete safe and efficient power engineering assignments across a range of sectors. With vast experience of working on projects both large and small, the firm holds particular expertise in providing turnkey packages for especially complex or high voltage jobs. Across the vast array of services we cover – including network connections, switchgear and transformer installations, cabling infrastructure and substation construction, to name a few – our highly trained team has the expertise to carry out end-to-end assignments, from design and build to testing and maintenance. Starting out in the commercial and industrial sectors, our service provisions have evolved over the years, and with that so too has our expertise. More recently, we have seen a marked upturn in renewables assignments for instance, and are currently experiencing a huge drive in demand from battery storage and capacity management projects. It is safe to say that the energy industry is not one to stand still, and we are determined to move along with it. We are already the contractor of choice for the UK’s two largest solar power developers and have worked on some of the biggest STOR schemes in the country. And as our portfolio of assignments across this complex field has expanded, we have increasingly been approached by energy providers and potential clients outside of the UK. So, with our rising number of completed connections and commitment to maintaining our steady growth, the natural next step was to expand our provisions overseas. After identifying a gap in the Irish market for the input of quicker programmes and improved health and safety practices, conversations have continued to unfold. As part of this, we are intent on building our team within Ireland and are eager to recruit bright local talent to contribute towards our engineering proficiencies, alongside our regional knowledge and understanding. For instance, transitioning from working with UK DNOs to Irish DSO/TSOs will invariably be aided by local expertise. We have already recruited a new head of operations, Michael McLaughlin, and are looking forward to welcoming more talented colleagues into the fold. But this expansion into Ireland is not the extent of the Smith Brothers’ journey – we have our eye on a number of other exciting opportunities within the energy sector and are also engaged in talks surrounding data centre connections as this goes to press. So, as we look ahead to the next few years, we are excited to see what this next Irish chapter has in store. With the 2020 renewables target deadline just around the corner, there is still a lot of work to be done in the country if the 16 per cent target set by the 2009 Renewable Energy Directive is to be reached. And with this push towards more efficient and sustainable energy solutions undoubtedly set to continue, we are looking forward to playing a part in this wider mission. The benefits of a turnkey package in any sector are widely acknowledged – communication is clear, consistency is achieved as standard and project coordination is far more efficient to manage. But when it comes to high voltage electrical engineering projects, end-to-end service providers can fulfil more than just efficiency requirements. 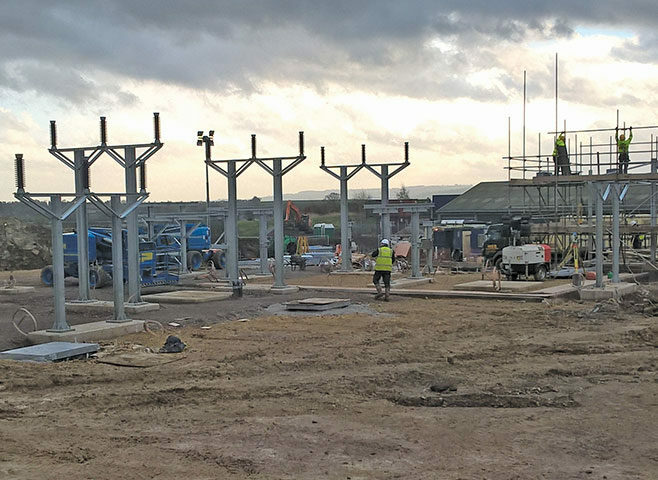 Therefore, when Anesco required a contractor to complete a 66/11kV 65MW fully adopted outdoor substation for Drayton Manor – a solar farm which now generates enough energy to power more than 14,000 homes – turnkey specialist Smith Brothers was a clear choice. With decades of experience working on high voltage electrical assignments, the firm was enlisted to carry out the entire design-to-commission project. A 25-strong team was deployed on the job, conducting all required works from start to finish – including design, cabling, civil construction, primary plant procurement and installation, main and remote substation construction, full commissioning and testing. Spanning 96 hectares, the terrain was largely flat, even and straightforward to navigate. Nevertheless, before the design stage could be conducted, a significant number of studies were required to establish key specifications for the build and connections. These included geotechnical, topographical, harmonic and P28 analysis, with the commencement of the electrical, primary plant, civil and protection designs taking place shortly afterwards. The overall project was then divided into two key phases, covering the construction of the primary 66kV hub and the further build of nine remote 11kV adoptable substations, to reinforce its ability to cope with demand. 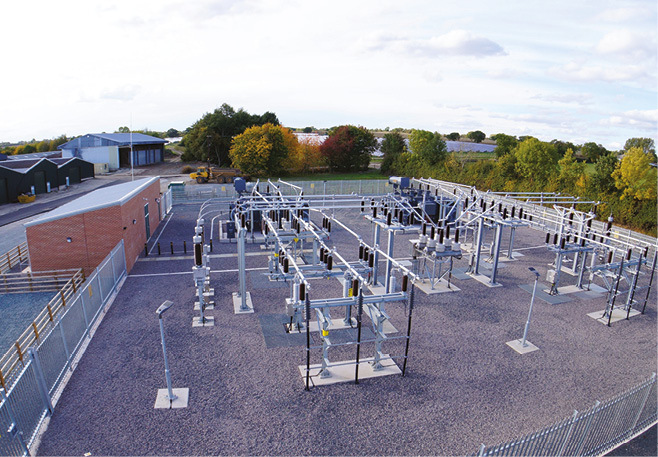 Phase one involved the construction of the first five contestable assets, along with the connection of a transformer, while a second transformer entailed the installation of a further four WPD-owned substations. With the assignment requiring extensive construction works, intuitive project scheduling and a fast turnaround was required by the Smith Brothers team. Alongside the build of the main protection and switchgear unit, the works also entailed all procurement of 11kV switchgear, Battery Tripping Unit (BTU), protection panels. Additionally, as part of the remote substation works, integral switch panels were also installed in each. Alongside the civil works, the installation of all primary plant including disconnectors, switchgear, transformers and protection was completed as part of the primary plant procurement. HV cabling infrastructure was also delivered within this package, with the team connecting a high voltage 1000mm 66kV cable to take the line capacity from the Point of Connection (POC) to the primary hub. Fully commissioned on behalf of WPD, the 66kV/11kV project also included the G59 testing on-site for the client. The end-to-end aspect of the contract meant that transitions between the design, civils and cabling could be conducted smoothly and without hold ups, and the team achieved the completion deadline. The high voltage specialists have been contracted by Anesco for nine separate projects now, thanks to their efficient executions and commitment to working collaboratively to achieve the best results.